Equipment Rental & Repair - Keen Compressed Gas Co. 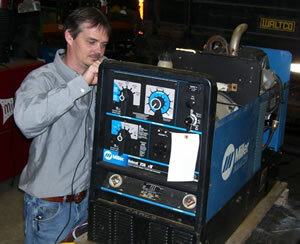 Keen Compressed Gas Co. has a meticulously maintained fleet of modern Miller welders available for long or short term rental. We also have cylinder cages available for both propane and high pressure cylinders. Our fleet includes engine driven units up to 600 amps, plasma cutting systems to 1 1/4 inches, aluminum spool guns, TIG units from 90 to 400 amps, MIG units to 600 amps, multi user systems including inverters and lengths of welding cable. Click here to see our rental offerings. Please call (302) 594-4555 for pricing and availability. Customized Preventative Maintenance Programs to keep your equipment running at peak performance while reducing down time. Check with us for current repair lead times. Field service available for specialized equipment.